Ascendo DataVault is a secure password manager that allows you to store personal information such usernames, passwords, PINs, etc. using the most powerful encryption technology. You can store up to 10 fields and additional notes with each Item. For example, a health insurance item may include your subscriber number, group number, plan, primary physician, etc. You can change the icon and field labels for each item. Items can be organized into categories and types. Examples of categories could be Personal and Business. 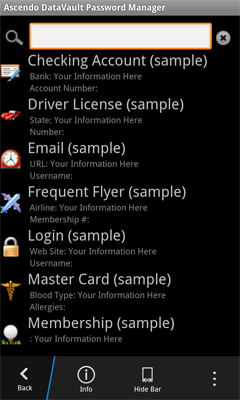 Examples of types could be Credit Cards, Logins and Memberships. Classifying items using categories and types provides an intuitive way to organize, display and find your confidential information. DataVault provides a set of templates that can be used to enter similar items more quickly by providing default field labels. For example, you may have several logins that each have a username and password. Creating a login template allows you to create new logins without having to re-enter each field labels. You can display Items in list view or tree view. List view displays each item in a separate row with columns for each field, similar to a spreadsheet. Tree view displays items as branches in a tree where the first level is category, the second level is type and the third level is the item. You can find items quickly by typing characters into the search field at the top of the main window. The information displayed reduces to only items containing the search string. DataVault includes numerous features to manage the security of your information such as field masking, password hint, security timeout and a customizable password generator. DataVault for BlackBerry 10 can be synchronized with DataVault for Mac and DataVault for Windows (sold separately). The DataVault desktops allow you to import data and synchronize it with DataVault for BlackBerry 10 devices. DataVault protects your confidential information by requiring you to enter a master password each time you start the application. The master password is used to encrypt and decrypt your data. When you first start DataVault, you will be prompted to select a master password then enter it a second time to make sure you don't make a mistake. You can change your master password at any time by tapping on the Menu key and selecting More > Change Password. A password hint is an optional security setting that you can use to obtain your master password if you forget it. The password hint consists of a question and answer of your choosing. For example, you might enter "What was my fist telephone number?" as the question and then enter the correct answer to be stored in DataVault. If you forget your master password, you can click on the Hint button in the login window. DataVault will display the hint question and prompt you for the answer. If you enter the correct answer, your master password will be displayed. To create a password hint, enter a question and answer when setting up your master password. To add an item, click on the menu key (3 vertical dots) in the lower right corner, then select Add Item. Tap on a field and select Edit from the pop-up menu. Then enter the contents of the field and click on Done to return to the add item form. To edit an item, tap on any item in the folder or list view to go to the item edit screen. To change an item icon, click on the icon in the upper-left of the item form. An icon matrix will appear. Click on an icon to select it and return to the item form. To modify an item name, field label, field contents or notes, tap on the element and select Edit from the pop-up menu. After you are finished, tap Done to return to the item form. If you enter a string of characters into the field contents starting with http://, DataVault will assume it is an internet address or URL. After saving the item, the field will become actionable. This signifies that you can click on the link and select Open in Browser to go to the web page. Tapping on an email address will display and option to Send Email. 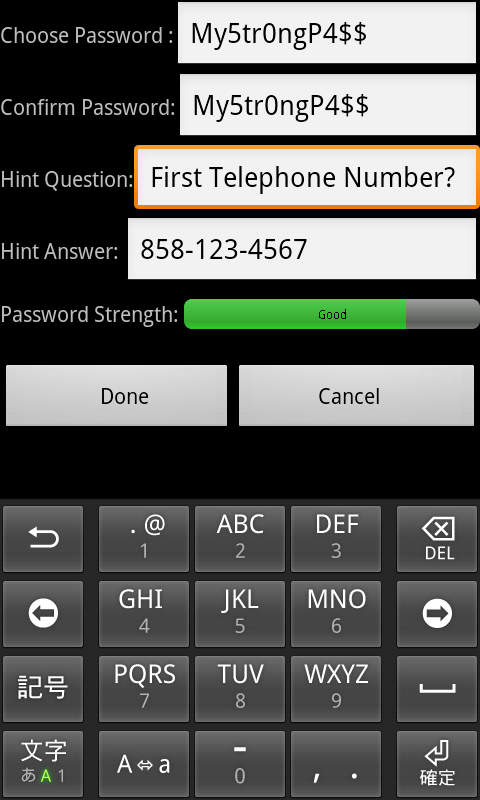 Tapping on numeric field will display an option to Call the number. To use a template, click on the Menu key andd tap on Template in the Action Bar. Choosing a template will automatically fill the item form with a default icon, field labels, category and type. For more information, please see the section on Templates. By default, DataVault will store a new item in an Unfiled folder. To change a category or type, tap on Unfiled > Edit and select from the list. The edits you make are automatically saved. When you are done editing, tap on the Escape key to return to DataVault home screen. To delete an item, click on the item name in folder or list view then click on the Menu key and select Delete from the Action Bar. To view items in a tree, organized by category and type folders, click on the Tree View button in the toolbar. If the number of items exceeds the screen size you can swipe across the screen to scroll through the items. To expand or collapse a level in the tree, click on category or type folder. To expand or collapse all levels in the tree, click on the Expand All or Collapse All buttons below the tree. You can change the position of types and items by tapping on an item, then changing the category and or type on an item. To view items in an alphabetical list, click on the List button in the toolbar. If the number of items exceeds the screen size you can swipe across the screen to scroll through the items. To search for an item, tap on the Menu key and select Search from the Action Bar. Each time you type a character, the tree or list of items will reduce to include only those items containing the search string. For example if you type car, items such as Mastercard and Car Registration will be displayed in the list. Clicking on the Delete button to the right of the search bar will clear the field and display all items. 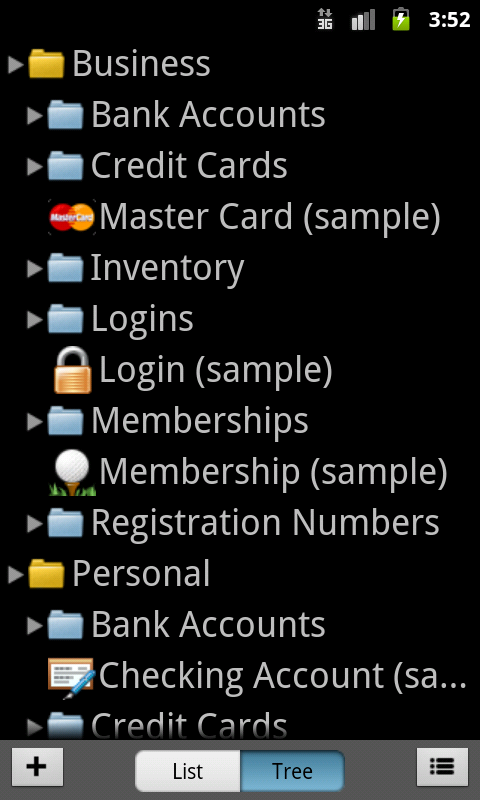 Items can be grouped into categories such as Business, Personal, etc. Each category can include several types such as Credit Cards, Logins and Memberships. An Unfiled category and Unfiled type are created when DataVault starts for the first time. These folders cannot be deleted. To add, edit or delete and Category or Type, tap on the Menu key, tap on More > Manage Category or Type. If you delete a category or type, DataVault will ask you if you want to move nested items by tapping on the checkbox, or delete them permanently. Templates allow you to set a default icon and field labels for items that are similar. For example, all credit cards have a number, expiration date and security code. Instead of entering the same field labels each time you create a credit card item, you can select the Credit Card template which will fill the field labels automatically. DataVault comes with a set of 25 pre-defined templates. To use a template with an item, tap on the item name then tap on the Menu Key and select Template from the Action Bar. To add a template, tap on the Menu Key then select More > Manage Templates. Tap on the Menu Key again and select Add from the Action Bar. To edit a template, tap on the Menu Key then select More > Manage Templates. Tap on an template in the list to display the edit template form. Tap on the template icon, name or any field to edit then tap on Done. To delete a template, tap on the Menu Key then select More > Manage Templates. Tap on an template in the list to display the edit template form. Tap on the Menu Key and select Delete from the Action Bar. The password generator can be used to suggest new passwords based on user-defined settings. To invoke the password generator, click on the Menu key then select Passwords Generator from the Action Bar. Alternatively, you can invoke the password generator when editing an item field by tapping on the Generate Password button. You can select the length and types of characters to include in the passwords. Each time you change a setting the suggested password will be updated. To cut and paste a password, tap on the Copy button at the bottom of the password generator screen. Navigate to a field that can be edited, tap and hold the field for two seconds, then select Paste from the pop-up menu. DataVault provides several security settings to establish safeguards for accessing your data. 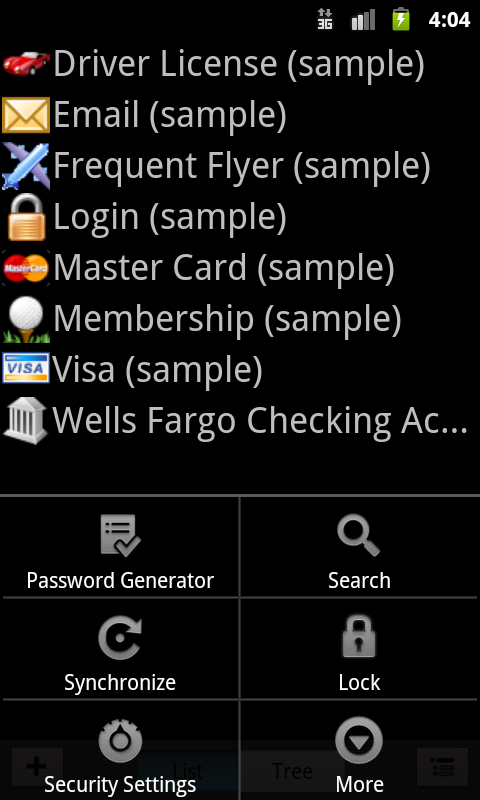 To modify these settings, tap on the Menu Key and select Security Settings from the Action Bar then tap on Done to save. A security time out is the period of inactivity after which DataVault will prompt you to re-enter your master password. This protects you from forgetting to quit DataVault. You can change the security time out by tapping on the Menu key, selecting Security Settings from the Action Bar and selecting the number of minutes from the Security Time Out drop-down list. The logout lock time is the number of seconds after which DataVault will require a login when switching applications. For example, you could copy a username to the clipboard, hold down the menu key to switch to your browser, paste the username and switch back to DataVault before the Logout Lock Time expires without having to re-enter your master password. If you enter the wrong password when starting DataVault you will be alerted and given another chance. After a user-defined number of attempts, the database will be reset. This protects you in case your device is lost or stolen and a stranger tries to access your data. 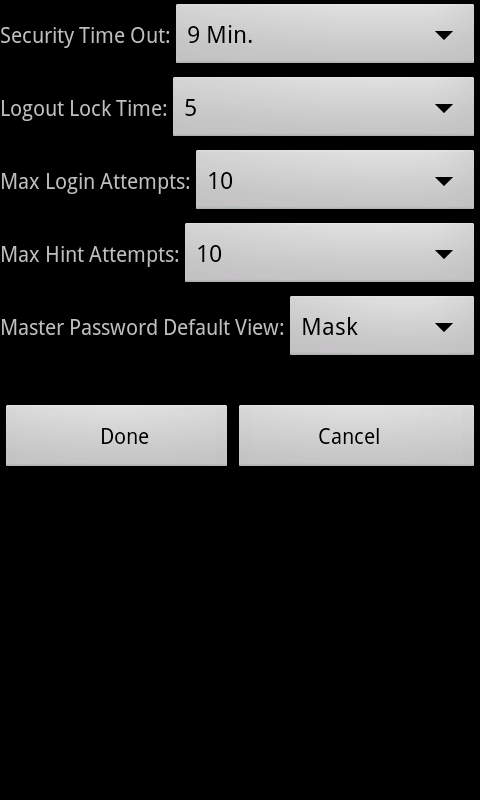 To change this setting, tap on the Menu key, select Security Settings from the Action Bar, select Max Login Attempts then select a number of login attempts from the drop-down list. DataVault allows users to create a secure copy of all the items, categories, types and templates stored in DataVault using the backup feature. You can store restore the data from this backup in case you DataVault information on your device is compromised. To backup your data, click on the Menu key, tap More then select Backup & Restore. DataVault will suggest a filename including the data and time. Tap the Ok button to accept the filename or select your own. Your data will be encrypted using your master password. To restore the data, tap on the Restore button and select the filename of the backup you would like to restore. DataVault for BlackBerry 10 can synchronize items, categories and types with DataVault for Mac or DataVault for Windows desktops (sold separately). DataVault implements 2-way synchronization meaning that all additions, edits and deletions are taken into account regardless of the device on which they are initiated. If the same piece of information is modified on two devices then DataVault prompts the user to choose which version to keep. This is called conflict resolution. 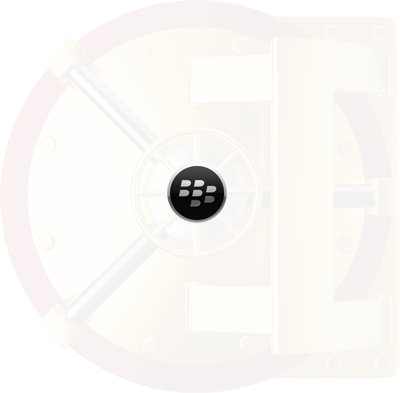 To synchronize DataVault for BlackBerry 10 with DataVault desktop, the passwords on each device must be the same. You can verify the password on a device by using the unmask feature before you login. To modify a password select Change Password from the Options menu. For troubleshooting tips, see the Frequently Asked Questions (FAQ) page and contact Support if you don't find a solution. To synchronize over Wi-Fi, start DataVault for Mac or DataVault for Windows and select Synchronize from the menu bar. 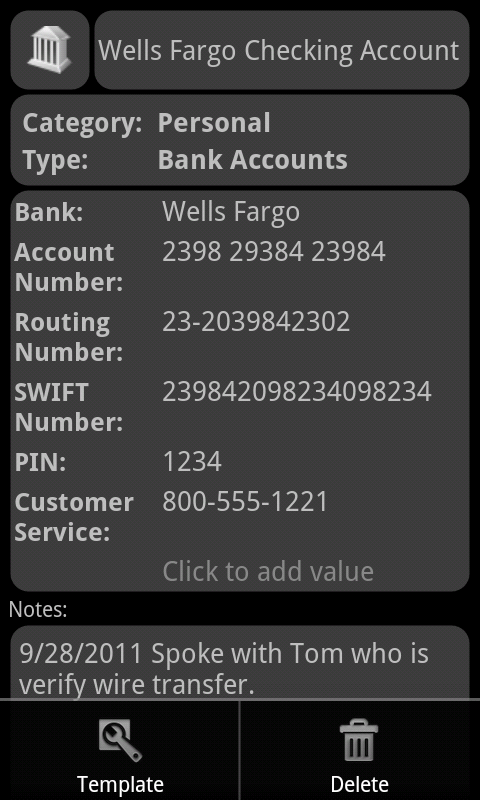 Start DataVault for BlackBerry 10, tap on the Menu key and select Synchronize from the Action Bar. Choose Sync through Wi-Fi from the list and tap on Next. Verify that the IP Address and Port settings are the same as those used by DataVault desktop, see below. If necessary, change the IP Address and Port parameters to match DataVault desktop. Then tap on Sync Now. Mac OS: Start System Preferences and click on Network icon. Your IP address is in the Status section. Windows & Vista: Click on Start and type "run" in the search field. Click on Run in the search results to start the Windows command line, then type ipconfig and click on the return key to display your IP address. See Questions page for more information on troubleshooting Wi-Fi sync. WebDAV is a file sharing protocol used by DataVault to synchronize information between handheld and desktop versions. DataVault for BlackBerry 10 supports several free WebDAV services such as Box.net, Swissdisk and MyDrive. To see the complete list of supported WebDAV servers, start DataVault for BlackBerry 10, tap on the Menu Key then select Sychronize > Sync over WebDAV. Once you have created your WebDAV account you can sync by following the steps below. Enter the WebDAV username and password into DataVault for Mac > Preferences > Sync Settings or DataVault for Windows Tools > Syncrhonization Settings. Select File > Synchronize from the DataVault desktop menu. Start DataVault for BlackBerry 10, tap on the Menu Key and select Synchronize from the action bar. Select the appropriate WebDAV service from the menu and verify the username and password. Tap on Continue > Sync Now. Dropbox synchronization is not currently available due to a bug in the Dropbox for BlackBerry protocol. However, we expect it to be available soon so please check App World for updates. While waiting, we suggest using one of the other synchronization methods. DataVault for BlackBerry 10 can synchronize with DataVault for Windows (v4.8.21+) using Dropbox, a popular data storage service. To synchronize using Dropbox, create a Dropbox account then follow the instructions to install Dropbox on your Windows and BlackBerry 10 device. Once installation of Dropbox is complete, follow the steps below. In DataVault for Windows, select Tools > Synchronization Settings from the menu bar. Select Dropbox by clicking on the radio button. Click on Ok at the bottom of the window. DataVault should open the default browser to the Dropbox login screen. Select the DataVault confirmation window in the task bar and click on the OK botton. Select the DataVault Synchronization Window and confirm that Logged in as: appears below the Dropbox selection. Select File > Synchronize from the DataVault for Windows menu bar. Start DataVault for BlackBerry 10. Tap on the Menu button then tap Synchronize then select Sync through Dropbox and login if necessary. If you are using DataVault on an iPhone, iPad or iPod Touch and want to import to DataVault for BlackBerry 10 there are two ways to proceed. The first is to use DataVault for Mac or DataVault for Windows as a conduit. Start by backing up your data on iOS, then sync DataVault for iOS to DataVault desktop and sync DataVault desktop to DataVault for BlackBerry 10. DataVault desktops include free trial periods so you don't need to purchase them to move information from one device to another. Alternatively, you can move data directly from iOS to BlackBerry 10 by following the steps below. Backup the information stored in DataVault for iOS to *.dvx file using Options > Backup & Restore. Connect your iOS device to your desktop with a USB cable and start iTunes. Select your device in the left panel of iTunes and click on the Apps tab. Click on DataVault and scroll down to the File Sharing section. Save the *.dvx file to your hard disk using the Save to.. button. Copy the *.dvx file to the SD Card on your BlackBerry 10 device. Run DataVault on BlackBerry 10 and restore the *.dvx file from the Backup & Restore menu. If you are experiencing technical difficulties using DataVault and you are not able to find solutions in the user guide or FAQ page, please send an email to wallet_support@ascendo-inc.com. For all other comments, suggestions or inquiries, please email info@ascendo-inc.com.